I love music. I especially love getting to preview a friend’s band’s debut album. It’s a real treat for the ears. Miss Guided Angels just completed their debut album, “The One That Got Away,” and they’re having a CD release party Oct. 25 at the Brick Box at Paramount Theatre in Rutland at 7 p.m. It’s $10 to get in, and you get a copy of the CD and/or a download card. I got a chance to speak with Nostrand. He has no problem finding people to play with him. “My first album, ‘Radio Songs,’ started out as a solo album and I had 20 guest musicians. 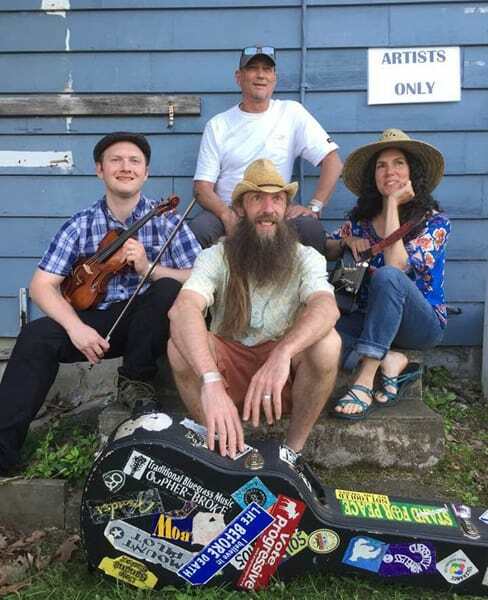 I’m really fortunate between my job at the Rutland Herald and having played in the area for so long that I’ve made great connections with many musicians. They’re all very generous and very quick to jump onto the project,” Nostrand said. Every song is awesome. I thoroughly enjoyed listening to the album and will be again. It’s well-produced and that credit goes to Phil Henry. His decisions of what to have where and when to feature it, is perfect. The band is tight, the vocals are great and it’s a good mix of instruments. They have every cool instrument covered. I like the choice of having a cajon and not drums. Nostrand added, “Having Bob play cajon is a perfect match for an acoustic band. It really drives the songs along.” Nostrand wrote seven songs, Gardner wrote two and there’s one by Josh Brooks. I like the way Nostrand writes with his story telling; it’s easy to follow along. “I don’t know where the songs come from. They just come into my head, I write it down and all of a sudden they’re there,” Nostrand explained. The album kicks off with “Rollin’ Home,” which is a great beginning song. It’s a feel-good song, a sit-back-on-your-porch-and-crack-a-cold-one type of song. There’s a great mix of vocals and Kalb’s fiddle solo is sweet. Song two is “Lost-N-Found.” It has a bluesy, country feel, but by country I mean country and western, not the pop country of today. I could hear this in a “Roadhouse” type of bar. I really like Levy’s piano playing and Leone’s guitar solo. Song three is “Baby, Let’s Drop It.” This is an easy listening, chill song. There are really good harmonies with Nostrand and Gardner. Song four, “The One That Got Away,”is the title track, and my favorite. There are sweet vocals by Gardner and nice harmony with Miles. Kalb’s fiddle is a perfect blend. I didn’t want the song to end. Song five, “Stitched With Love,” is one of those songs that I still have the lyrics playing in my head. It’s an upbeat jammin’ song. This one switched to Barron on fiddle and added Henry on mandolin. I really like the band sound here. Number six, “Token Blues,” is another big favorite of mine. We go back to the blues and it’s so good. I really like the lyrics and Nostrand’s and Gardner’s back and forth. This one has Wecott’s harmonica, which is solid and prominent throughout. Song seven is “Leaves” and once again we hear Gardner’s sweet voice. Her vocals are easy on the ears. Nostrand is on piano and organ, which is rare for him, but it sounds good. Number eight is live with “Griswold Drive.” This song pumped me up. It’s a feel good song like “Rollin’ Home.” Kalb’s fiddle is awesome and so is Nostrand and Gardner’s singing. What I like best is the simple instrumentation with just fiddle and cajon. Number nine, “Here Today, Gone Tomorrow,” is another chill song with that good story telling. Gardner and Nostrand have good harmonies on it. The last song on the album is “Bottom of the Bottle.” This is a good, fun song. I love the fiddle, love the vocal outbursts and love the Angels Bar Choir. You can’t not clap and sing along. I felt this song in my body, it’s so good. The song came about because Nostrand and fellow musician, Mike O’Brien were having a beer and Nostrand said, “Mike, you know the bottom of the bottle comes too soon.” O’Brien told him he had to write a song about that. The song is unique. Hongisto’s vocal outbursts were not planned and Henry wanted to add anyone who was there, to the song. His wife Allison wandered in and he put her on the mic, too. Nostrand wanted a party song; mission accomplished. Nostrand has played around Rutland for years with different projects, but this one’s different. “This band really highlights the songs. I’ve been in bands where the songs are secondary to the music. This is a singer-songwriter album.” I highly recommend buying this album, you will not be disappointed. There’s something for everyone.